In and of itself, memory loss is a multi-faceted condition that can be disturbing to experience. However, there are various conditions that can cause memory loss in adults besides dementia, including diabetes. Continue reading to learn more about the relationship between memory loss and diabetes for a better understanding of the breadth of each condition's severity. Diabetes is a chronic condition that results from high blood sugar (or blood glucose) levels. This occurs because there is a dysfunction in the hormone insulin. Insulin helps glucose arrive to your cells, providing them energy. Without insulin, glucose stays in your blood, causing serious health problems. Type 1 diabetes. It usually develops in children or young adults, which is why it was commonly referred to as juvenile-onset diabetes. Type 1 diabetes occurs your body doesn't produce insulin - or produces very little - for reasons not completely understood. Type 2 diabetes. Type 2 diabetes accounts for the majority of diabetes cases. It is commonly called non-insulin dependent diabetes or adult-onset diabetes. This type occurs when your body produces insulin but doesn't utilize it properly, as is the case with insulin resistance. Type 2 diabetes may remain undetected for years and is often associated with obesity. Gestational diabetes. This type of diabetes develops during pregnancy. It can cause complications for both mother and baby if left uncontrolled. Gestational diabetes usually resolves itself post-partum, but mothers and babies are at risk of contracting type 2 diabetes later on in life. When a person has blood sugar levels that are higher than normal, but not high enough to be categorized as diabetes, this is referred to as prediabetes. Memory loss, also known as amnesia, is defined as unusual forgetfulness. It can be forgetfulness of activities or memories both short- and long-term. In general, aging is the most attributed reason for memory loss. As you grow older, it is common to fail to recall things you could once recall instantaneously, forget where you placed your keys or glasses, etc. Depending on the cause, amnesia may go away on its own, or it may worsen. What is the Relationship between Diabetes and Memory Loss? Research studies have found that high blood glucose levels can lead to memory loss. Uncontrolled diabetes causes damage in the peripheral nerves of the brain by injuring the body's nerve cells, supportive glial cells, and blood vessels. It has been found that high blood sugar levels harm capillaries, which are responsible for trading glucose and oxygen between tissue cells and blood vessels, producing cognitive problems. However, keep in mind that various other medical conditions can cause memory loss, such as thyroid, kidney, and liver disorders; alcoholism; blood clots; tumors; head injuries; nutritional deficiencies; and more. Moreover, for women passing through menopause, hormonal imbalance is a common cause of memory lapses. 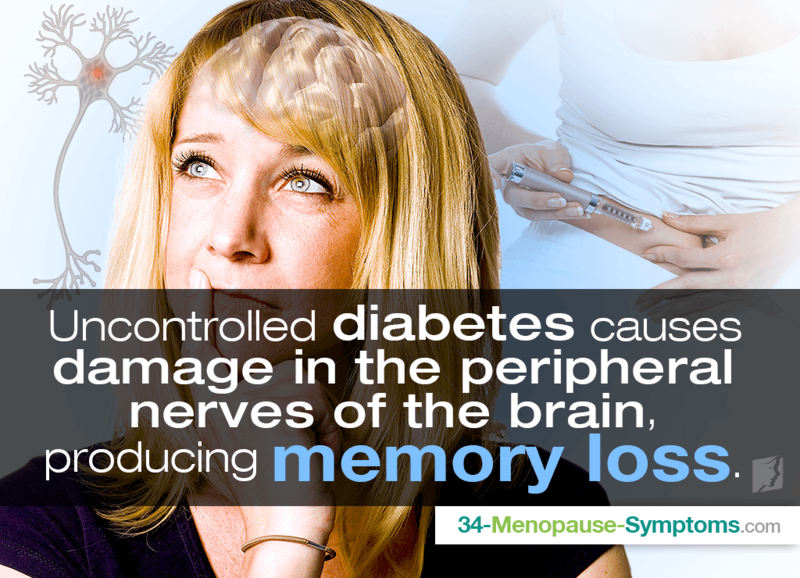 In summary, there is a strong link between diabetes and memory loss. Uncontrolled high blood sugar levels can damage the body's peripheral nerves, thus causing cognitive issues and subsequent memory loss. Nevertheless, as you work with your healthcare practitioner to find the right treatment for you, don't forget the link between menopause and memory lapses, as treating the hormonal imbalance may be your secret weapon against fleeting thoughts. Consult your doctor before making any major changes to your medication routine. Find out the most common medications that may cause memory lapses here.